Using a credit card should be a simple process. It’s designed that way. Merchants, customers and most of all credit card companies prefer it that way. You swipe, you sign, you’re done. Not so fast. If you’re an American traveler and have traveled much outside North America, chances are you’ve encountered difficulty on more than one occasion – not because your card isn’t accepted, but because your card is nearly a decade behind the times. Welcome to the world of smart chip technology. A smart chip is a 3x5mm embedded plastic chip positioned on the front of credit cards that can securely store encrypted information and provides stronger security measures than a traditional magnetic swipe card during a purchase. You simply insert your card into a chip reader, wait for authentication and if necessary, sign your receipt as you normally would. “Chip and sign” has replaced “swipe and sign”. One other security note – as most U.S. smart chip cards still carry a magnetic strip, they do not offer the same level of security as European smart chip only cards in the event of a card loss. They still provide protection at the point of sale, however. With a magnetic strip card, personal information can easily be pulled off a card when swiped at the point of purchase – an identity theft practice known as “skimming”. This process is far more difficult with a smart chip, which carries additional encryption measures and generates a unique code read by the card reader at each and every transaction. Even if personal information on a smart chip were duplicated into another card, it could not be used for purchases as the code generated would not match that of the original card. We strongly advise getting a smart chip credit card before your next trip abroad as traditional U.S. cards are being increasingly rejected overseas. Technically, you can still insist on conducting a transaction in Europe with your Visa or MasterCard the “old-fashioned” way (swipe and sign) when a merchant refuses your card, but this is becoming more difficult by the day. (If a merchant accepts Visa or MasterCard, they are required to accept your card, even without a smart chip). But it’s a process for them, it’s a process for you, and it’s one we don’t advise. At best, you’ll get unfriendly looks from the staff and at worst, you’ll get drawn into a long, technical argument with a restaurant or store manager – all over the usage of a credit card – not ideal when you want to relax on vacation. Trust us – get a credit card with smart chip technology before your next trip abroad. It will make things a lot smoother. So which card should you get? The U.S. market for smart chip cards is thin, but slowly improving. However the market becomes even smaller when you look for smart chip cards that eliminate foreign transaction fees. As we’ve noted in prior articles, avoiding foreign transaction fees (usually 3 percent of each transaction) is an absolute must of any savvy traveler. Paying the banks 3% of every transaction you make is not only costly and unnecessary – It also wipes out the value of any points you’re earning with the card in the first place. Therefore, if you don’t have a card that offers this, you’re literally giving your money to the banks. Currently, the best choices, far and away, for U.S. customers that meet this criteria are the Chase Hyatt Visa and the Chase British Airways Visa. In addition to offering smart chip technology and no foreign transaction fees, they provide point bonuses to two of our favorite rewards programs. The Chase Hyatt Visa is among the best credit cards on the U.S. market today, offering good value and a strong signup bonus in addition to its smart chip and no foreign transaction fee perks. After spending $2,000 in the first three months after account opening, customers are awarded two free nights in any Hyatt property worldwide. That’s right – ANY Hyatt property worldwide. This includes such high-end properties as the Park Hyatt Paris-Vendome, Andaz New York, Andaz London, or the Park Hyatt Tokyo, famously depicted in the film ‘Lost in Translation.’ Moving even higher, you could stay at the Park Hyatt Maldives. Two nights in this resort would normally cost you around $2500. And you get it all for just spending $2,000 on your card! 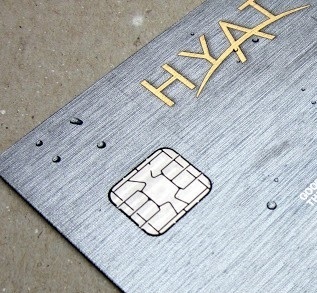 In addition to the two free nights signup bonus, customers get one Gold Passport point (Hyatt’s rewards points program) for every dollar spent, two points for every dollar spent on restaurants, rental cars, and airline tickets (when purchased directly from the airline) and three points for every dollar spent at Hyatt properties. On the next page, you’ll be presented with a billing field as if you were about to finalize a reservation. Ignore the details and scroll to the bottom of the page. On the lower right, you will see an offer for the Hyatt Visa offering a statement credit after your first purchase. At the time of writing, the offer is for a $50 statement credit, although this offer has fluctuated in the past from $75 or even a $100 statement credit, making this card even more valuable and easily taking the sting out of the $75 annual fee. Our advice is not to worry about the statement credit fluctuating and getting an extra $25, and to get the card well before your next trip. This card truly offers thousands in value and is one of the best on the market today. British Airways Avios is another RLB favorite rewards program. Luckily, there’s a credit card to match. The Chase British Airways Visa comes with a smart chip, no foreign transaction fees, and gives customers 50,000 Avios after making $2,000 in purchases after account opening. In addition, customers earn 1.25 Avios for every dollar spent, and 2.5 Avios for every dollar spent on British Airways purchases. The $95 annual fee is waived for the first year. The card does come with an annual fee of $95 the first year. We’ve yet to find a way around this particular annual fee, but this card is still worth your attention simply because of the extremely generous 50,000 Avios signup bonus. Unlike many U.S. frequent flier programs, Avios rewards are distance based – meaning you need more points for longer distance flights. For example, a round-trip from New York to London costs 40,000 Avios, but a round-trip from Los Angeles to London would run you 50,000 Avios. This can be a negative when attempting to fly from California to London, for example, but it can also be a positive when flying short distances. London to Nice would only run you 9,000 Avios, for example. Avios can also be used on Oneworld partner airlines, such as American Airlines. This provides outstanding value for distance, especially in the northeastern U.S. A round-trip flight from New York (JFK) to Washington (DCA), an expensive business commuter route, would normally run 25,000 miles with American Airlines. With Avios, it’s a mere 9,000. In fact, you could take this trip five times and still have Avios left in your account. It’s all about getting the most value from your points and with 50,000 Avios, the possibilities are almost endless. Both of these cards offer outstanding value for money. As always, choose whatever suits your travel needs. If you can meet the $2000 in three months spending requirements, we strongly suggest applying for both cards. You’ll be enjoying two highly valued travel rewards programs and with the addition of a smart chip card when traveling abroad, bringing your wallet technology ahead by a decade. * – Taxes, fees, and carrier charges still apply to reward tickets.